When Picasso frequented Paris cafés for his morning café au lait, art was one thing, and the drink was something completely separate. Today, lattes make delicious canvases for creative baristas, and The Dripolator Coffee Bar in Asheville is showcasing that artistic outlet with its monthly Thursday Night Throwdown foam-art competitions. Though some coffee shops use stencils to create designs—solar systems and bunnies, for example—there are no lazy tricks in this rumble. 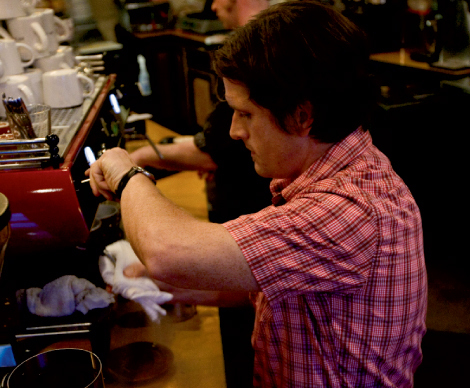 Jay Weatherly, the shop’s owner, grinds the espresso beans and the competitors steam the milk. Baristas representing shops across town pour the drinks, using free-form movements to draw the designs. The judges choose the winning cup based on aesthetic value and pouring technique, rather than flavor. The champion gets the proceeds from the $5 entry fees, as well as bragging rights—at least until next month’s showdown.